The School for Energy Efficiency helps companies and individuals capitalize on the growing interest in costs savings through improved energy efficiency. As governmental agencies promote a whole-building approach to efficiency, homeowners and business owners will increasingly look for a new breed of professional who offers a systematic, science-based approach. We teach building science and certify students as building professionals under the auspices of the Building Performance Institute (BPI). The School for Energy Efficiency provides training in energy efficiency and accredits contractors under the auspices of the Building Performance Institute (BPI), which is the leading credentialing organization for energy efficiency professionals in the country. BPI certification is a prerequisite for participation in more than 100 government-funded incentive programs across the country. Our training courses are a cut above the rest. We meet the requirements for certificate training, and then we go further. We draw on extensive field experience to help our students grasp the practical applications of energy efficiency in the energy and building comfort industries. There is more to building efficiency than science: Professionals need to leverage energy auditing services into business opportunities, and we show them the way. Hands on learning happens in our on site test house. Your training will include hours of real, hands on testing with working heating and cooling equipment. 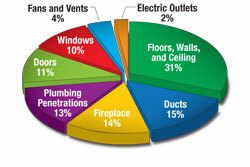 CT State building codes now require certified duct leakage testing of all newly installed duct systems. BPI’s IDL certification teaches the proper testing procedures and assessment. We also cover general information on Duct sealing and understanding of Air handling systems as well as other related information. New to Home Performance? Begin here. If you are visiting our site because you are new to the home performance industry and want to learn more about the science behind it, you've come to the righ place. Home performance is the whole house approach to improving comfort, health, safety energy efficiency and durability of a home. To learn the basic concepts of how this all comes together, consider taking our two day class called BPI Building Science Principles. You can earn a certificate at the end of the session by successfully completing the online test. Armed with all this new knowledge, you can continue on with more training or take what you learned and put it into action in your current job. Learn more. Next class is June 15th.